Made a purchase at Macy’s recently? It’s now time to review it. And to reward you, you’ll be automatically entered into the Macy’s Customer Product Review Sweepstakes for a chance to win a $1,000 Macy’s gift card. 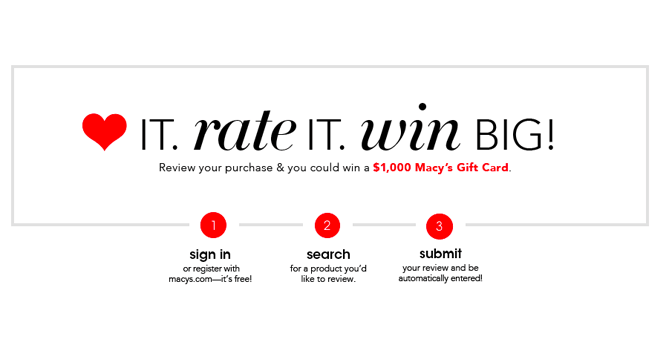 If you prefer to participate without submitting a review, just go online at www.macys.com/productreviewsweeps and complete the form as instructed to receive one entry into the sweepstakes. To participate, visit www.macys.com now through June 28, 2017 and complete these three following steps. First, sign in or register with macys.com (it’s free). Second, search for the product you’d like to review. Finally, submit your review and be automatically entered! In order to submit a review and be entered into the Macy’s Customer Product Review Sweepstakes, you must be a legal resident of one of the 50 United States or the District of Columbia, Puerto Rico and the territory of Guam and be at least 18 years of age or older as of the date of entry. You may submit your review(s) during the entry period beginning at 12:01 a.m. ET on April 5, 2017 and ending at 11:59 p.m. ET on June 28, 2017. Only one winner, selected in a random drawing on or about July 26, 2017, will receive $1,000 awarded in the form of a Macy’s Gift Card. For name of winner, send a self-addressed, stamped envelope to: Customer Product Review Sweepstakes, WINNER, c/o 1440 Broadway, 13th Floor, New York, NY 10018. Vermont residents may omit return postage with Official Rules request. Write in for winner on or by August 9, 2017. Sponsored by Macys.com, LLC, 1440 Broadway, New York, NY 10018.